Machine Gun Section, 5th Canadian Mounted Rifles, 8th Brigade, 3rd Canadian Division, C.E.F. Next of Kin: Son of William James and Dora Ellen Rowberry of Oak Villa, Worcester Road, Malvern Lin (later of Pickersleigh Cottage, Madresfield Road); husband of Lilian M Bottomley (nee Rowberry) of 45 Chapel House Road, Nelson, Lancs. 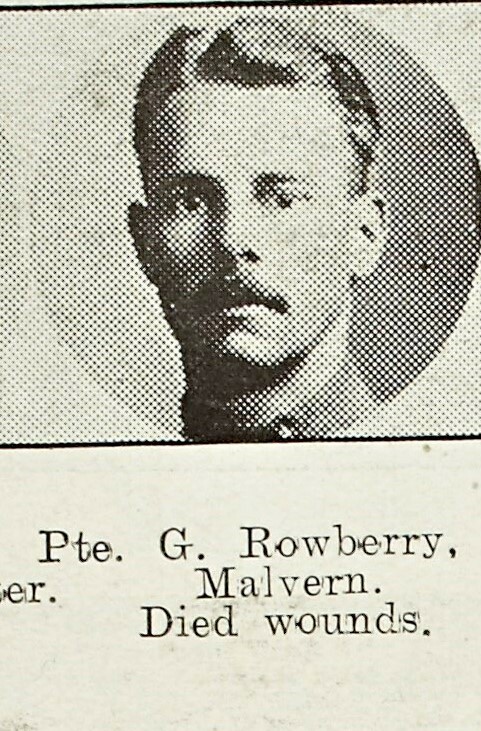 Mrs Rowberry, Pickersleigh Cottage, Madresfield Road, has received the information that her son Pte George Rowberry, CMR MG Section, has died of wounds in September 1917. He was wounded in the breast and died whilst being conveyed to the dressing station. 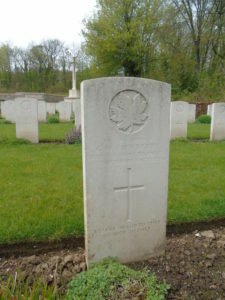 He joined the Canadian Forces at Peterborough, Canada in November 1915. Before emigrating to Canada he was for employed for sometime at the Union Club, The Cross, Worcester and was a member of the Territorials. Aged 25, he leaves a widow and 1 child, now in Canada. Mrs Rowberry had another son, Joseph killed in 1915.